It is not possible to explore how the technology impacts our lives and how it will impact the future. The processes of scientific-technological development represent themselves as by all means a notable fact the mankind has a fortune to encounter in the twenty-first century. Technology is nowadays becoming more and more synonymous to the notion of anthropocentricity. In this respect, the tendency of impersonalizing and, thus, dehumanizing the spheres that traditionally belonged to the domain of human activity is observed. Doublethink itself is the processes of thinking and rationalizing from the facts of objective reality. 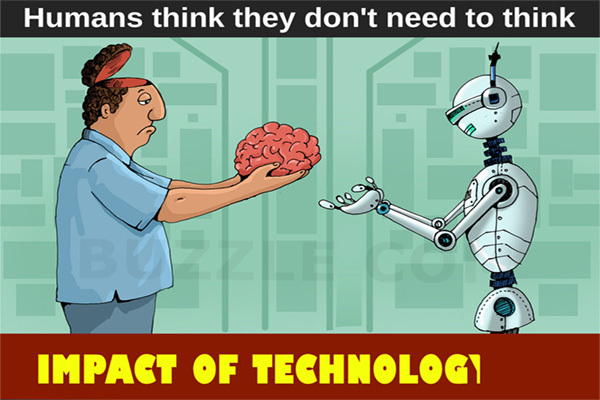 The impact of technology on human life has both positive and negative aspects. Positive effect is embodied in the sphere of its practical application. On the other hand, the negative impact of technology on human life concerns predominantly the cognitive aspects of human mental activity. Therefore, the crisis of the worldview systems manifested itself as another peculiar feature of the period of rapid technological development. The processes of rapid technological development, in their turn, were accompanied by stagnation of art. However, there is no denying the fact that science, philosophy, religion, and art are in inseparable connection. All aforementioned tendencies may be traced through the lens of art. Especially on the example of a dystopian novel by George Orwell 1984 and Stanley Kubrick’s science-fiction movie 2001: A Space Odyssey. In both works, the negative aspects of technological evolution of mankind lead to the tragic end since technical appliances constitute the system of total control over humanity and each individual in particular. The peculiarity of George Orwell’s novel consists in the completeness of the author’s vision of the alternative future. Which is determined by the technical progress. The author provides a detailed description of understanding of the distorted by technologies society which he presents in the novel. To start with, in the fictional country Oceania, the ruling party is IngSoc (contracted form of ‘English socialism’). People communicate with each other by means of the Newspeak, which constitutes itself as a distorted version of English language or the outcomes of the language degradation processes in action. A model of class society is comprised of the three main elements – upper-class, the Inner Party, middle-class, the Outer Party, and the Proles (the so-called proletarians). Ministry of Peace, or Minipax predominantly deals with the issues of warfare. Ministry of Plenty, referred to as Miniplenty in the novel, deals with the economic sphere (e.g. rationing and starvation). Ministry of Love, Miniluv, is focused mostly on the issues of law and order (e.g. brainwashing and torture). Finally, the Ministry of Truth, Minitrue, distorts the news and manipulates education, art, and entertainment represents the mechanisms of propaganda, power, and therefore, the dominance of the state over people’s minds and feelings. Each morning, the citizens are gathered in front of the large screen to participate in the ritual of Two Minutes Hate – a procedure in course of which the darkest and most disgraceful side of human nature is revealed and released. Rage, anger, fury, wrath, and hatred towards the political undesirables are the imperative of social behavior that exists within the Orwell’s model of society. However, the latter is perverted, distorted, and manipulated by the authorities in every possible way. Thinking and rationalizing abilities, in their turn, are in disgrace, unaccepted by the authorities and rejected by the mass. People are haunted by the presence of the Big Brother – an impersonalized image of the ruler who controls the situation. Nonetheless, while the ruler controls the situation, he also controls the minds of people: each man, woman, and, the most terrifying, child. Thus, the essence of being is reduced to a formula which goes as following: “War is peace. Freedom is slavery. Ignorance is knowledge”. Hence, each of these aspects is predetermined by the technologically-oriented nature of society depicted by Orwell. Moreover, as far as the issue impact of technology on environment is concerned, it is important to admit that mechanization is one of the basic principles and specific features of the anti-utopian world. The Advance Technology will change the world society. Orwell’s vision of this world minimizes the presence of nature and its effect on human consciousness. Incapability to rejoice and feel the beauty of nature indicates the numbness of soul. Consequently, the only thing a man is capable to feel is hopelessness and despair. The Orwellian society is, above all, of industrial character. To be more precise, technology is the calamity in such community since it is turned into a tool of control and manipulation over the minds of people and their consciousness. A Space Odyssey, “The Dawn of Man”, deals with the issue of origin of life and evolution. The movie’s main part, however, is the director’s artistic meditation on futuristic vision of the world and, therefore, addresses the future of mankind. impact of technology in movie is represented by the HAL 9000, “a malevolent, homicidal intelligent computer”, who controls all the operations on board a spaceship Discovery (2001: A Space Odyssey). Hal is a sentient, precise, and strict mechanism hiding the real mission of expedition. HAL did not tolerate any manifestation of suspicion and lack of confidence (2001: A Space Odyssey). Having overheard the private conversation between the pilots and considering their distrust in artificial intelligence, HAL kills one of the pilots in the outer space and turns the space ship’s life support systems off. The tragedy ends in disabling HAL and reaching the Jupiter. Thus, in this way, the technology’s rule is overthrown. The Monolith, a powerful artifact, enabling immediate transportation in time and space, and the Star Child in the movie make the effect of contrast between the nature’s creation and the power of human thought and abilities. The director’s philosophy in this case emphasizes the fact that human being is the creation of nature, and, hence, man is an integral part of nature. Must Know: Beware of Blue Whale Challenge: Shares Terrifying Details! Technologies developed by mankind threaten with destruction. Consequently, the director assumes that the future of the mankind is far beyond the Solar System. Ridley Scott and Steven Spielberg revere and give their credit to Stanley Kubrick and his 2001: A Space Odyssey in terms of the storyline and its visual interpretation. Undoubtedly, Stanley Kubrick’s contribution to the science-fiction genre in cinematography is exceptional in this respect. The director has foreseen the space line of technological development, particularly, landing the Moon and its exploration. George Orwell, in his turn, has prophesized the increasing role of television and mass-media in human life. To summarize, in two art works under analysis, the tragic influence of technology on the mankind is reconsidered. This process is related to the authorities and the military forces’ wish to rule the minds and control the consciousness. Attempting to turn people, who initially were capable of thinking and feeling into the mass of blind and deaf executors? Another important observation is in the fact that the protagonists in both storylines attempt to liberate themselves from the dominance of power and technology. Mechanization and technological advancement dehumanize the image of world. In this regard, the term ‘individual’ does not apply to characterization of an average man of future. Of course, the novel and the movie demonstrate the pessimistic creative impulse and the tragic pathetic elements. Nevertheless, the heroes of both genres prove that human spirit prevails over technology. In George Orwell’s novel, the protagonist is conquered by the power of the system whose rule is absolute. In Stanley Kubrick’s movie, the power of the human will triumphs, which indicates a more optimistic ending. In both cases, the main characters give their lives to overthrow the authorities’ control provided and ensured by their tools. Above all, this constitutes the most terrifying threat and most painful reality to which the technical appliances as such and technology in general may lead the mankind on the point of collapse. Taking into consideration all the facts aforementioned, I assume that both stories seem relevant to the reality of rapid technological progress. The reality the people of the twenty-first century live in. That is, the reality created by both George Orwell and Stanley Kubrick sound as topical nowadays as they might only had in the next twenty years after the end of the World War II. This is especially just considering the issues of strategic and military build, globalization, constant technological advancement, dehumanization of interpersonal communication, and cosmic exploration. However, Stanley Kubrick’s 2001: A Space Odyssey sounds more topical and more relevant to our present-day context considering the issues of development of science and technology, and the part military sector plays in the life of civilian people. About the author: Billy Bakevrton. Works as an editor at https://gogetessays.com/ the resource with helpful pieces of advice for students who are struggling with their academic assignments. He is fond of traveling, discovering new cultures, he is a bookworm as well and likes to spend time reading in a quiet and cozy atmosphere and also adores psychology.